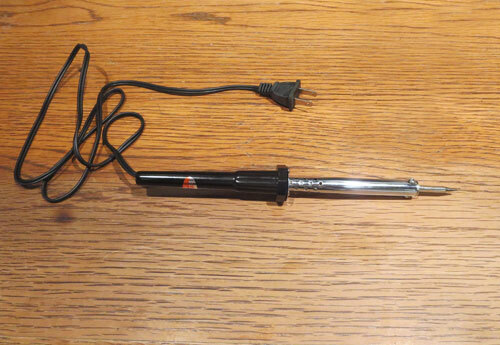 Some plug-in soldering irons are adjustable. Some models have a temperature adjustment built into them and function like a light dimmer. Although better than units without any kind of temperature control, they are somewhat limited. I was looking at PID temperature controllers and learned that they worked with K-type thermocouples. 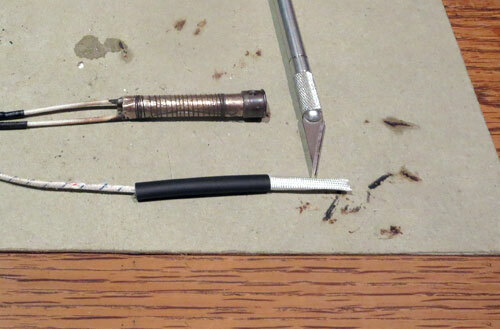 Then I started looking at K-type thermocouples and I thought that there may be a way to insert one of them inside a soldering iron and take a reading from the back of the heating element on the opposite end of the soldering tip. Of course, the temperature at the tip of the soldering iron was the most important, but I had a hunch that the reading at the rear of the heating element just might coincide with the tip temperature. 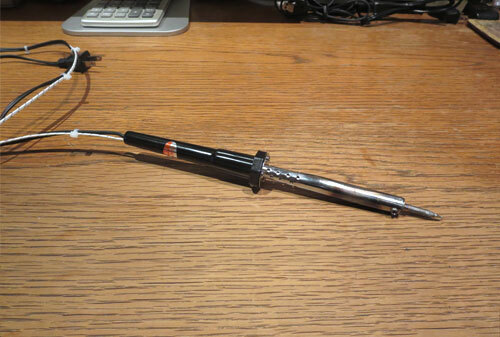 I have read an online article about a soldering iron modification with a K-type thermocouple mounted externally. That was an excellent article but I would prefer that the thermocouple be mounted internally and out of the way. 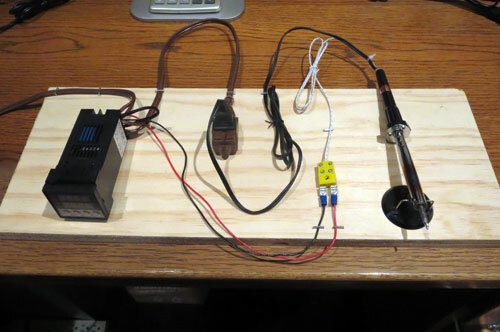 The total cost of a PID controller, soldering iron and thermocouple (1 meter length) for this project was about $20 USD. The thermocouples were bought 5 at a time for a better price break. I figured I might need a few extras. As it turned out I broke the spot weld on one of them. I twisted the ends together and it worked – sort of, but they really need to be spot welded for best results. I decided on a 60 watt soldering iron for the build. I was hoping that it would heat up in the range of 650° – 700°F (343° – 371°C). Luckily I the one I ordered fit the bill. This unit reached a maximum of 386°C for me, so I was happy. I didn’t want to use a 30 watt unit because I felt that 30 watts wouldn’t get hot enough. This unit was easy to tear down, so after removing a few screws I could take a look at the inside and figure out how I was going to mount the thermocouple. Most inexpensive plugin soldering irons have a mica heating element. 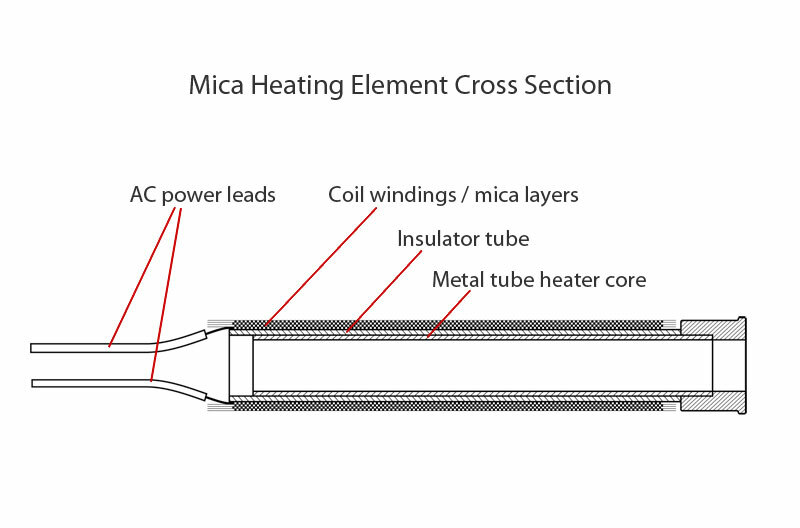 The heating element is constructed of coil windings separated by layers of mica around a hollow metal tube. There is an insulator tube that fits over and extends beyond the edge of the metal tube. The part that extends beyond the edge of the tube serves keep the lead wires from coming into contact with the metal tube and shorting out the unit. These lead wires are very fragile and can easily break. The unit had a knot in the power cord for strain relief to keep tension off these wires. This is important to keep in mind when working around them. Below is a photo that shows the various materials used for the modification. Going left to right and top to bottom: a 3/16 inch heat shrink tube, 600°C fiberglass sleeve, 1 meter thermocouple, soldering iron plastic handle, power cord, heating unit enclosure and heating element. The fiberglass sleeve was 4mm inside diameter and was rated at 600°C. The thermocouple is rated for temperatures between -50° to 700°C. The thermocouple will be located at the rear of the heater core where the temperature is in the range of approximately 350° to 500°C. 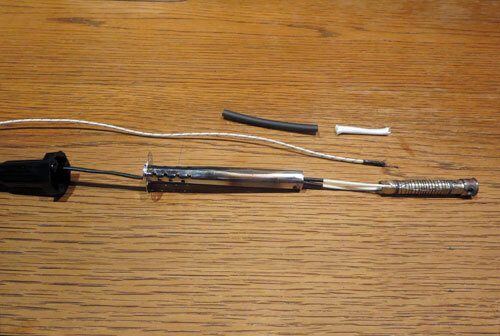 The next photo below shows the thermocouple, fiberglass sleeve and heat shrink tube pre-assembled before heat shrinking. The utility knife blade points to the approximate location of the thermocouple tip inside the fiberglass sleeve. 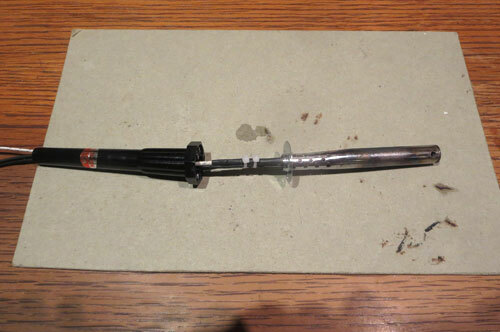 The heat shrink tube must be located at some distance from the end of the heating element otherwise it will get burnt. The section of fiberglass sleeve must be long enough to allow a little bit to be inserted into the end of the heater core tube to help steady the thermocouple and keep it in a stable location. 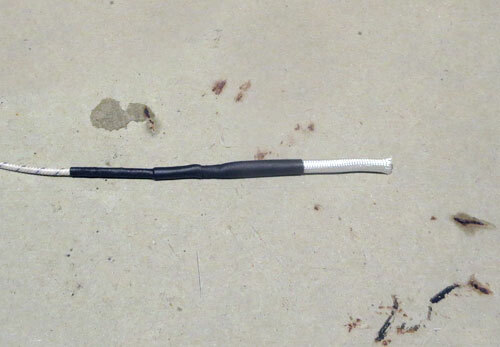 The heat shrink tube is what holds the fiberglass sleeve to the thermocouple cable. The fiberglass sleeve must also be long enough to allow adequate overlapping of the heat shrink tube for a secure fit. The heat shrink tube I used was 3/16 inch inside diameter. This was a good fit to shrink down tight against the fiberglass sleeve, but not enough to shrink down on the cable, so a second piece of 1/8 inch heat shrink tube was used to hold the first piece onto the cable. That second piece must be threaded over the end of the cable ahead of time before heat shrinking any of the pieces down. Next, the thermocouple was inserted into the end of the heater core and then secured to the power cord with a small zip tie. I used a small, 2.4mm flat blade screwdriver to gently thread the end of the fiberglass sleeve into the rear of the heater core. Then I used one zip tie just to hold the thermocouple in place while I threaded the bundle of wire back through the metal enclosure tube. Then I attached the second zip tie. It was a bit of a squeeze because the enclosure tube on this soldering iron was tapered on the end that fastens to the plastic handle. The last step was to tie a knot in the power cord for strain relief. The purpose of the knot is to keep pressure off the lead wires on the heating element. As I mentioned before, the lead wires are very fragile. Even without modifying the soldering iron, if pressure on the power cord were to cause the lead wires to snap, you don’t want there to be the possibility that live AC voltage could come into contact with any of the metal parts of the soldering iron. That could cause the unit to short out. You don’t want to be touching anything metal on the soldering iron if that happens. At this point I reassembled the unit. It took some trial and error, but after a few times disassembling and reassembling the soldering iron, I managed to find the “sweet spot” for the thermocouple near the back of the heating element on the inside of the unit. Note: The thermocouple is very sensitive and the temperature can vary with the slightest change of position. With a little patience it can be done, though. The next thing was to connect the PID controller to the unit and see if the tip temperature would match up with the internal temperature throughout a range of temperature settings. 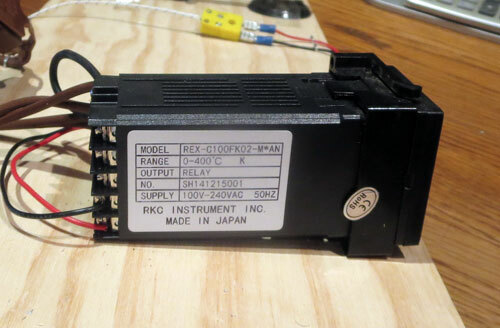 This particular PID controller was a REX-C100 unit – model number REX-C100FK02-M*AN. 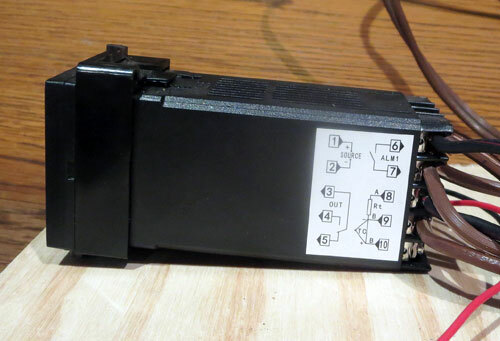 The unit had a built-in relay and would run on 110v/120v AC power. 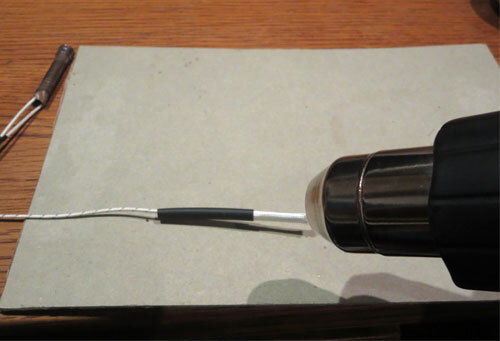 It accepted the input from a K-type thermocouple and was good for a maximum temperature of 400°C. Note: Although the thermocouple I used on the soldering iron was rated for -50°C to 700°C, the REX-C100 PID controller would not exceed 400°C. A more suitable PID controller would be one which would allow higher temperature settings than this unit. 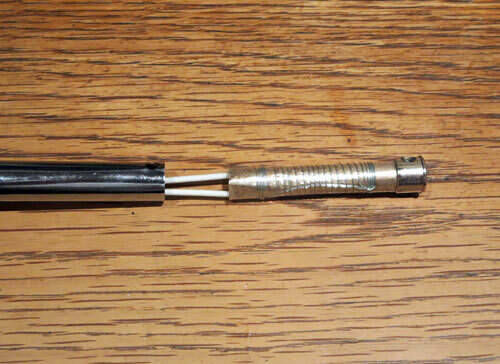 But this unit was adequate for this soldering iron because its maximum temperature was below 400°C. 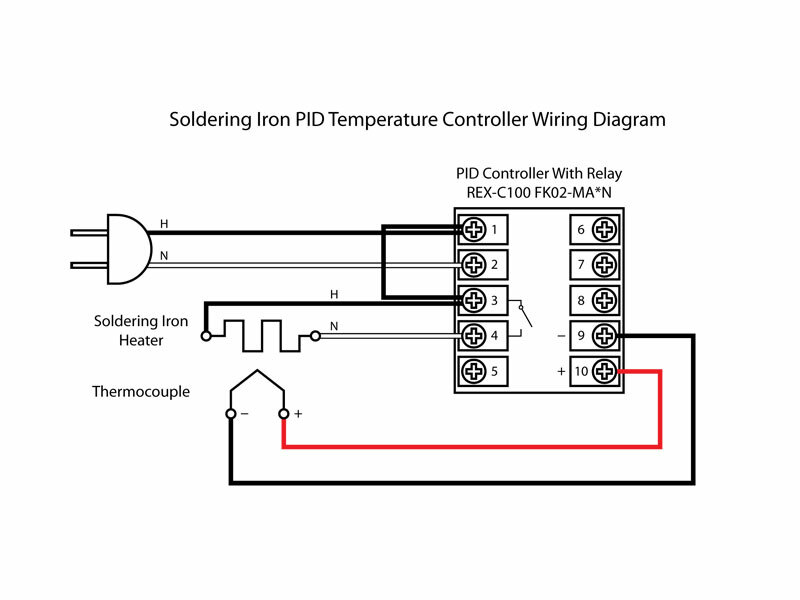 These PID controllers come in many different configurations and are all wired differently. It is important to check the wiring label on the particular unit one is working with for how to make all the connections. You can see by the terminal connections label that power is supplied through terminals 1 and 2. The hot (live) conductor connects to terminal 1 and the neutral conductor connects to terminal 2. The thermocouple connects to terminals 9 and 10 (negative and positive, respectively). Terminals 3, 4 and 5 are the output contacts of an SPDT relay with terminal 4 normally open and terminal 5 normally closed. We want to connect the soldering iron power cable between normally open terminals 3 and 4 so that when the relay is energized it closes the circuit that sends power to the soldering iron. 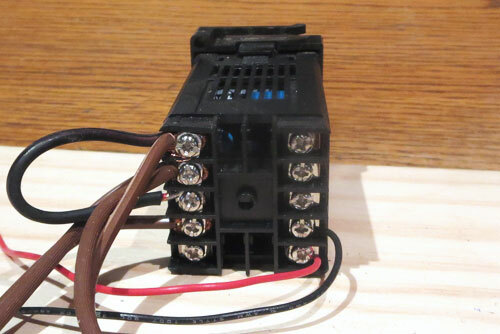 The normally open relay between terminals 3 and 4 is basically an unpowered switch so you need to jump a hot wire from terminal 1 to terminal 3 to supply power to the circuit that powers the soldering iron. You can see the black jumper wire from terminal 1 to terminal 3 in the photo above. You can also see the thermocouple red and black leads connected to terminals 10 (positive) and 9 (negative), respectively. I used an old brown extension cord cut into two pieces for the test board. The female connector was used to plug the soldering iron into and the male end was needed to plug into a wall socket. Shown below is a photo of the arrangement of the components on a test board. 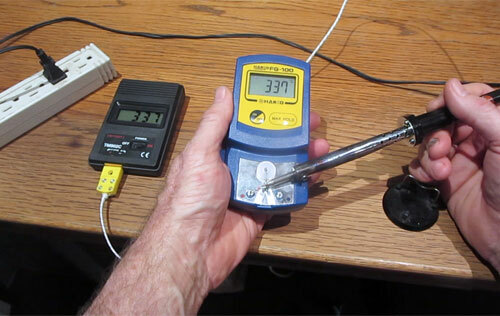 The tip thermometer was necessary to check the temperature of the soldering iron at the tip and compare it with the internal temperature of the thermocouple inside the soldering iron. The test was to compare a range of temperatures of the the unit at 200°C, 250°C, 300°C and 350°C. The test results were very encouraging. The internal temperature varied by only a few degrees with the temperature of the soldering iron tip. The two readings even coincided a couple of times. 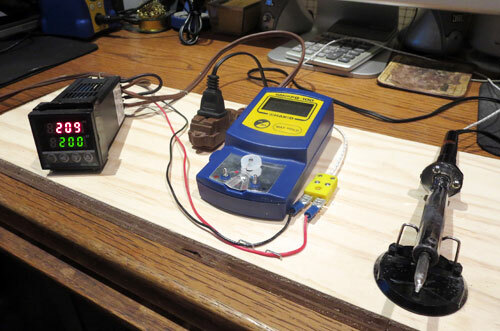 A setup similar to this experiment can be useful for day to day use, although the performance doesn’t come anywhere close to that of a high quality soldering station like a Hakko FX-888 or similar unit. PID control for a soldering iron is slow. It takes awhile for the soldering iron to reach the temperature setting. 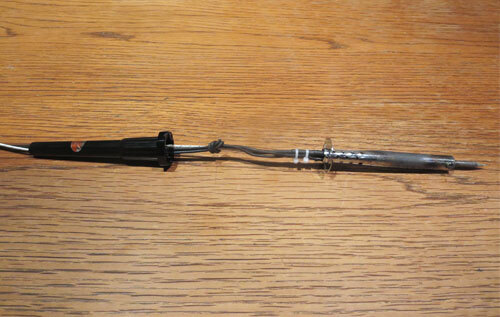 Compared to soldering irons with mica heating elements, soldering irons with ceramic heating elements heat up very fast. Even if a similar setup could be put together using a soldering iron with a ceramic heating element, the PID controller would slow it down. The controller circuitry used in commercial soldering stations are designed to heat up very fast. But if one is willing to set the PID controller to a certain temperature and leave it there most of the time, I feel it is definitely worth the money and effort to build one of these units for regular use. Interesting build. I built one very similar to this, I even used the same model PID controller! My version didn’t drive the iron directly, though, but controlled an SSR that switched AC to the iron. I also didn’t mount the thermocouple inside the iron, but just wired it to the outside. (The tc I have is very, very long). It works ok, but the temperature swings were very wide when I did things like cleaning the tip on a wet sponge. The PID controller seemed to have trouble adapting to sudden changes like that. For as much as I use a soldering iron I decided it was worth $100 to just buy a nice digital Hakko. 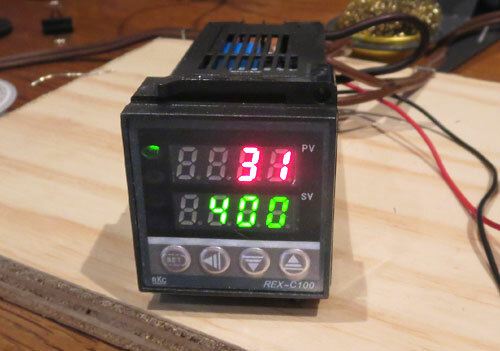 I do intend to reuse the PID controller setup for a reflow oven when I get around to building one. Nice build, keep up the good work! Just saw a nice JBC soldering station on ebay that is broken but heats bright red hot! I wonder if this technique can be used on this iron? It’s hard to say without more info. I’m not familiar with the JBC brand. If the soldering iron has a built in sensor it has to be either a thermocouple or a PT100 or one of the others supported by this PID controller. If it doesn’t have a built in sensor and it has a mica tube heating element, then it just might work and you can add your own thermocouple just like in the blog post.